OUR PASSION MAKES THE DIFFERENCE. Created from experience, proven building science, and pure love of all things wood. We are constantly seeking to educate ourselves on the industry’s new standards and green building techniques. This focus on education paired with a strong foundation of experience translates into smarter design, construction, and a quality finished product. We hire folks with whom share our keen eye for detail, practical creativity and versatility. After getting a degree in Environmental Studies and geology from Brevard College, Chris traveled North America rock climbing in beautiful places and working as a carpenter between climbing trips. 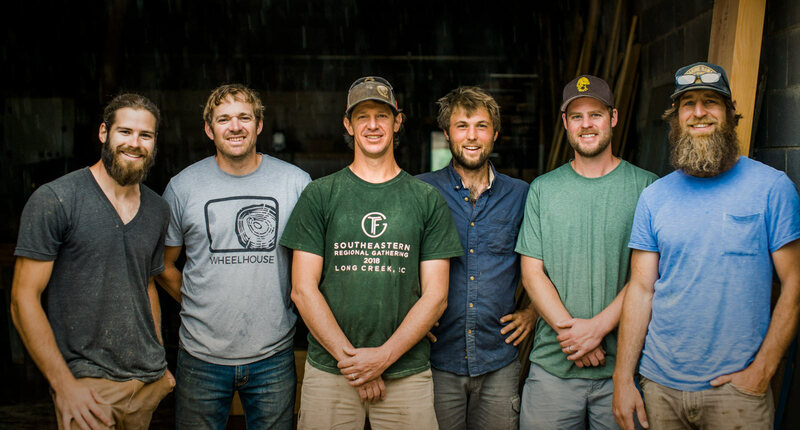 After working on renovations in Seattle, Washington, Chris was pulled back to the mountains of Western North Carolina and decided to settle again in Brevard where he worked on various crews building homes, timber frames, furniture and spending as much time as possible in the wood shop learning and experimenting. 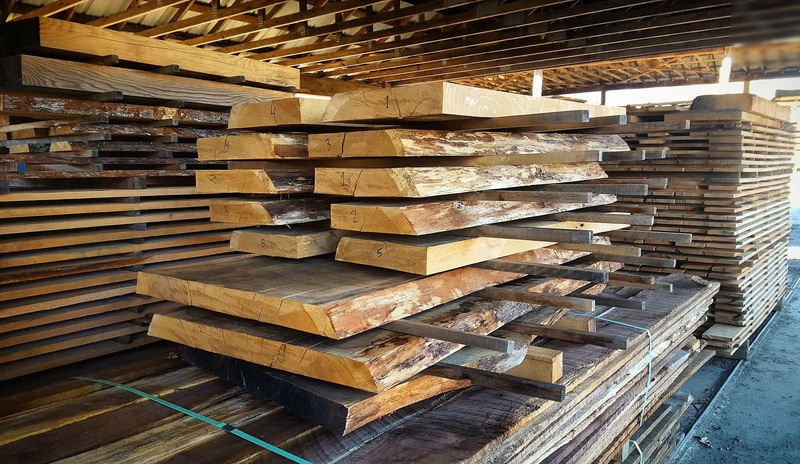 He began his own construction company, Faulkner Woodworking, in 2008 and has spent the last 10 years focused on doing more of the work he loves best… especially anything with timbers. In 2017, Faulkner Woodworking morphed into Wheelhouse as timber framing goals became more of a reality. Chris’s wife, Anna is an Occupational Therapist and keeps the Wheelhouse office running smoothly. If you can’t find Chris, he is in the woods, on a bike, or with his 2 sons, Charlie and Jasper. In 2010, Chris and Matthew helped to build a treehouse for friends. It would be a few years before the two would work together again, and to no surprise, it was a timber frame that re-connected them- they joined forces to teach a workshop and contract the building of a timber-framed horse barn in 2014. Matthew literally grew up on a job site as his dad was a General Contractor and carpenter in Santa Barbara, CA. After years of building and remodeling conventional or stick frame homes, he moved in 2011 to Vermont, with his sweetheart, to study timber framing and furniture making. His studies included time at YesterMorrow Design Build School and The Heartwood School for the Homebuilding Crafts; while working with Timber Homes LLC, and with Hugh Belton Furniture. Matthew, Lauren, and their two young sons live in downtown Brevard. When Matthew is not working, he is swimming or riding bikes with the family. When Lauren is not running, she is teaching yoga to seniors, children and everyone in between through her yoga studio, Brevard Yoga Center. Matt is from Alpharetta, GA where he grew up learning the art of beekeeping and restoring classic cars with his dad. He got hooked on carpentry soon after graduating from Brevard College when he converted a trailer into a house for himself, his sweetheart Lindsey, and their son Silas. Matt enjoys dreaming up big adventures traveling into the deepest corners of Appalachia. Some of his favorite hobbies are riding his dual sport, kayaking, and camping. Check out Matt's side business, Pure Pisgah Honey. Scott was born and raised in Vicksburg, MS at the southern tip of the Mississippi Delta. He learned to manage projects at a young age from his father as he built three of their family’s homes and numerous restaurants. Scott earned a degree in Marketing from Mississippi State University and moved to western North Carolina for the fresh air in the mountains. When he's not building he enjoys spending time exploring the great outdoors with his sweetheart Chelsea and their dog, Goose. Ron grew up right outside of High Point, NC in a 3rd generation furniture building family. At a young age, he was learning basic building and carpentry skills while helping out in the furniture shop. He now lives in a tiny home that he and his wife, Rachel designed and built together. Along with carpentry, Ron has an arborist background that adds a unique skill set to our team. Ron enjoys high adventure backpacking, mountain biking, and rock climbing. Building with environmental awareness, energy efficiency, and the local economy in mind. We place a large emphasis on using responsible and green building techniques with our projects. Whether it's enhancing our framing practices to ensure better insulation or building furniture with reclaimed wood, we are always mindful. You can trust that we work hard to keep our dollars in Western North Carolina and do our part to support the local economy.